Please see below for the indepth information on various print features offered by RockDesign. Emboss is a plate stamping process that results in a design element being pushed through the card. Because of this, one side of the design will have a raised design while the other will have a debossed (pushed in) appearance. Emboss can be combined with foil stamp or offset print to add an accent of color. When designing an embossed design, please allow for space on the other side of the card since both sides will be affected. Debossing is another one of our processes using plate and pressure. Instead of applying enough pressure to push through the cardstock, only enough pressure is used to create an indented look. This finishing can also be combined with foil, printing, or can be left “blind” for a subtler look. While debossing can be applied to all but our coated cardstocks (Silk and regular suede). Foil stamping uses a heated plate to apply metallic foil or pigment to the surface of the card. The result is a vibrant and highly saturated metallic appearance. Although this finishing cannot be color matched, we offer a wide variety of colors including; Regular Gold, Regular Silver, Matte Gold, Matte Silver, White, Black, Red, Copper, Rose Gold, Dark Blue, Light Blue, Green, Non-metallic green, Clear, Pearl, Hot Pink, Rose Pink, Holographic and even Rainbow. Our foil stamping is extremely elegant and each plate is created specifically for your business card design. Offset printing is a high-end method of printing that involves applying ink to a surface such as rubber and then pressing it onto the card. This offset process allows for clearer colors, clearer images, and spot color printing. The print quality of offset printing is higher than that of digital printing which is why we do not offer digital printing. Please note the cost of offset printing is not included in the base price of any of our luxury or premium cardstocks. If you require ink printing on any of these stocks, please select offset printing from the drop down menu. UV Printing is a form of digital printing which uses ultra-violet light to cure ink to surfaces. Its rapid drying speed while maintaining a high level of detail makes it the superior choice for printing on plastic! It is used to print black, greyscale or any colors, to create text, logos, or even photographs. Thermography is a heat applied process which results in a raised, clear, glossy finish. This finishing creates a particularly remarkable finish that allows the color of what is underneath to shine through. Thermography is an excellent way to enhance printing as well as can be used on darker cardstocks as well. Letterpress is a plate stamping technique where ink and pressure are applied to the cardstock simultaneously. The result is an indented appearance that is filled with a rich, highly saturated ink color. Letterpress is ideal for block colors and is perfect when used on our letterpress stock. This finishing can also be used on our smooth uncoated, and textured cardstocks as well. Our metallic ink is a form of brilliant metallic printing. This finishing is available in silver, gold or bronze and is ideal for printing text or designs onto a wide variety of our cardstocks! The appearance of metallic ink will be more opaque on the coated, plastic or metal materials than it is on our uncoated cardstocks, however, it remains an excellent way to add a pop of shine to your design! It is important to note that we cannot colour match our metallic inks and are unable to print gradients. 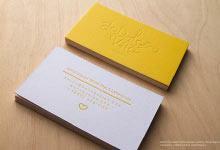 White ink is an excellent alternative to white foil since it creates a clean, matte finish. This finishing is available on all luxury and premium paper stocks and all plastic stocks apart from the Frost Polyester. White ink is a great option for more intricate and detailed designs and has an especially brilliant finish on our soft and hard suede stocks. Although it is not as opaque as our white foil, the overall finish of white ink is a much more accurate representation of the design. Die-cutting is a process where a metal die is used to custom cut the shape of the paper. It can be used to create a unique size, rounded corners, or a unique shape to suite your design’s needs. Die cutting can also be used to create cut outs on our paper or metal cards. Edge foil is a process where we apply the foil that we normally used for stamping to the edges of the card. The result is a beautiful metallic shine that adds an extra dimension of elegance and luxury to your design. It is available in all of our foil colors to suite your branding needs. Edge paint is an ideal way to either add a fun pop of color to your design, or to hide the white edges of your design. Edge paint can be color matched to suite your branding needs. Etching is a process that can be used only on our metal cards. It is used to create a slightly recessed appearance and even creates a matte look when used on our stainless steel cards. Etching is a luxurious and ideal finishing for detailed designs and is beautiful when paired with spot color. Laser engraving is a process that uses heat to engrave a design element onto the card. The resulting look is dependent on the cardstock selected. On our black duplex uncoated cardstock or our quick metal stock, laser engraving has an intriguing beige/bronze look. On our black metal business cards, laser engraving has a silver look. Laser engraving on our gold metal, stainless steel, and rose gold metal stocks results in a matte finish. Please note that laser engraving should not be applied to mirrored stocks and is not suitable for designs with fine details. Die cutting is a process where we can customize the shape of your card. 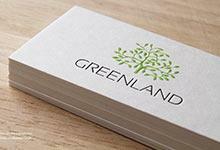 This is a great way to make your business cards a unique representation of your brand. We offer both simple and complicated die cuts allowing us to create everything from product tags to unique shapes. Cut through can be used on our paper or metal cards as part of a custom die cut. Die cutting is a unique process so it is recommended that you email your design to [email protected] prior to ordering. Spot color is a special technique with which we can apply brilliant solid colors to metal cards. Although it is recommended to be combined with etching, it can stand alone as well given the right design. 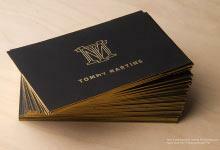 Our spot color is the perfect way to add your branding to our already exquisite metal cards. Our exclusive prism and frost finishings are an elegant etching process that is used on our luxury black metal cards to create a fingerprint resistant texture. Prism finishing creates a beautiful micro geometric pattern while frost finishing has an elegant and subtle texture. Opting for our luxury metal business cards with either of these finishings is a superb way to make a bold and confident statement about your company. Variable data is a way to include unique text, numbers or characters on each of your metal business cards. It can be applied using spot color or laser engraving and is perfect for including membership names or numbers. A design is considered full bleed when any printed elements extend within 0.25” of the end of the card. The reason for this is due to the printing process having to be performed prior to trimming the cards to properly execute the design and alignment. Thickness refers to the width of the card when examining the edges. We measure the thickness of our cardstocks in points which is is a standard unit of measurement. 1pt is equal to 1/72 of an inch. Size refers to the dimensions of the business card. The North American standard is 3.5”x 2” however we can produce odd sized cards to meet your needs. This is the material on which we print the cards. We offer a wide selection of everything from white to black, textured to smooth, and metal to plastic. Oversized plates are required for designs that are full bleed and use plate stamping techniques. Full bleed is a design that comes with in 0.25” of the edge of the card. Plate-required techniques include but are not limited to: Foil stamping, deboss, emboss, letterpress, and thermography. If the design comes with in 0.25” of the edge of the card a larger plate is required to be crafted to accurately complete the print job. If your design comes with in 0.25” of the edge please be sure to select this option on our price calculator. Laser cutting is a process which uses a laser to cut our acrylic cards into a unique shape. This finishing is an ideal way to add further personalization to your card order. Within the laser cut feature a custom cut out can also be included. Original finishing refers to the appearance of the stainless steel, gold metal, and rose gold metal stocks. Although it is not as reflective as our mirror finishing it still has an elegant sheen which is comparable to the appearance of standard high end stainless steel appliances. Original finishing is an excellent option for metal card designs that have large amounts of un-etched material since it is more scratch resistant that our mirror finishing. Original finishing is only available on our stainless steel cards. A different surface finishing can be used each side of our stainless steel cards with the restriction of there being only one per side. Mirror finishing is a beautiful way to create a highly reflective and polished look on our gold, stainless steel or rose gold cards. With this finishing the un-etched surface will have an elegant sheen. Mirror finishing is more prone to show scratches and blemishes. This finishing is recommended for use with designs where etching covers a large portion of the surface of the card. A different surface finishing can be used each side of our stainless steel cards with the restriction of there being only one per side. Brushed finishing is one of three surface finishing options we offer for our stainless steel cardstocks. This finishing creates a subtle linear brush pattern on the un-etched surface of the card. This finishing is ideal for clients with designs with both large amounts of etching or large amounts of un-etched surface. A different surface finishing can be used each side of our stainless steel cards with the restriction of there being only one per side.